The hunt started from this beautiful field where we all got to watch the hounds work. Saturday, October 8th we hunted from Red Rail Farm. It was a really beautiful day — up in the mid-70s and sunny — and we had a nice large turn out. The hunt started from one of the most beautiful fields around offering a fabulous view of the hounds as they started to work. We then moved off into the woods. Although the hounds started off well, they were diverted off the drag by some live scent — most likely deer — and while we could hear them give tongue off in the distance, they were not on the drag. That left the field waiting for staff and the hounds off the side of the trail, hoping not to disturb a nest of ground bees (one of my biggest fears when hunting on warm fall days). After nearly 10 minutes we moved on but at a controlled pace and continued on until the first check. Our first check was at a glade in the woods. It’s a very pleasant place to pause as it was a little cooler out of the sun and gave the horses and hounds the chance to catch their breath. The second cast went very well. 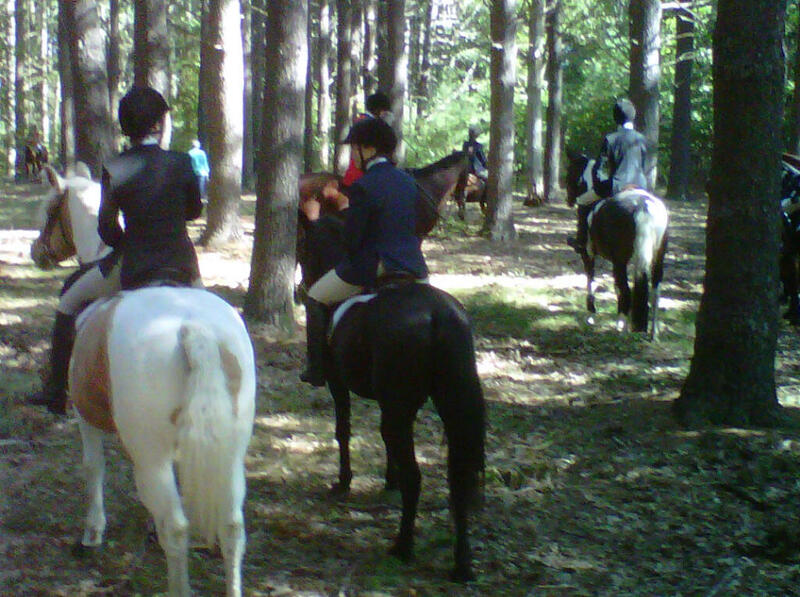 The hounds were back on track and we had a good gallop through the woods. We finished the hunt with an adrenalin charged gallop up the final hill. Freedom must have had some flashbacks to his racing days but we managed not to pass anyone. Thanks to Noel Estes, who led the jumping field, Debbe Kelley who lead the hilltoppers, and Dennis Kelley who led the third field. Jenn Fuller adds, “Anything that happened before or during the hunt was likely eclipsed by the LOBSTAH FEST! Thank you to our generous hosts of this annual tradition — Kim Johnson, Pam and Buzz Hawes, Cathy Shortsleeve, and Stephanie Juriansz. It goes above and beyond and sets the bar for the other teas so high, I’m not sure how the rest of us can hope to compete.